The Fugates, who are of French Huguenot extraction, were in Westmoreland County, VA, in 1664. A will of Henley Fugate was probated in that year. When they came to Virginia sometime before 1664 and settled in that county, the offspring moved West shortly thereafter. In the early seventeen hundreds they were in Botetourt County. Sometime before 1774 two of them, John and Tom Fugate, settled on Reedy's Creek in Washington County. By 1800 they were in Russell County, Scott County, VA, and Claiborne County, TN. On the maternal side of the family, the Bacon's have a long history. They came to America from England about 1660 and settled along the James River. It was here that Nathaniel Bacon lived when he led the Rebellion against the English Crown. A few years later they were living in Lunenburg and Mecklenburg Counties. Thomas Alexander Bacon and his wife, Patsey Goode Farrar, migrated from Mecklenburg County to Lee County, in 1870. Virginia Bacon was the youngest child, born after her father's death in 1876. Thomas Bacon Fugate was named for his grandfather. Thomas Bacon Fugate was born April 10, 1899. His place of birth was on a farm twelve miles east of Tazewell, TN, in Claiborne County, on Powell's River, near the Claiborne-Hancock County line. He has always been known as Tom. His parents were William Colbert Fugate and Virginia Alexander Bacon. Virginia Bacon was the second of three wives. Tom was the eldest of three children, and the other children were girls. There were two boys and two girls by the first marriage and none by the third. Tom's place of birth was the home of his paternal grandparents. Some of the farm land on which the home was built was granted from the State of Tennessee during the administration of John Sevier. The farm is still owned by Tom. William Colbert Fugate, Tom's father, was educated by private tutors and at Cumberland College in Rose Hill, VA.
Virginia A. Bacon, Tom's mother, born, reared and educated in Virginia was a school teacher. She was teaching in Tennessee at the time of her marriage. Tom's father was a farmer, lumberman and banker. Powell's River was a waterway that channeled millions of board feet of the finest saw logs of oak, chestnut and poplar timber to Chattanooga, TN. In his early years from 1883 to 1910, he was engaged almost exclusively in the lumber business. Tom proudly recalls that the Fugate family was one that lived by the teachings of the Bible. The real power in the family was the paternal grandmother, Rebecca Parkey Fugate, who lived to the age of eighty-nine years. She was a strict disciplinarian. She was married at sixteen to Henley Fugate, Jr. and mothered several children, who were all model citizens. No one questioned her authority. Tom's father was the youngest child. Out of respect for her as a woman and her success in what she had done, he listened when she spoke. Her requirement was that all must work. From the time one could carry a gallon of water from the spring, use a small hoe in the garden or carry an armful of stove wood she managed to keep him busy. She kept her eye on the farm work. When she saw something that needed to be done, she dispatched someone to do it. She checked later to see if it was done as directed. There was a feeling in the family that only those who worked were welcome to their food. The elder Fugate, being away from home in his business enterprises, left much to be seen after by the women. The religious and moral training in the family was a serious requirement. Reading the Bible and having family prayer at night was practiced. The grandmother knelt by her bedside before retiring for her lengthy prayer, no matter how tired she was. The ethical questions that arose in dealing with neighbors and business associates were always discussed and wise decisions were made in the family council. Tom's father, after most of the lumber was moved out of the area, turned to more intensive farming. He was always trying to improve his livestock and his grain crops. He invested his profits from his lumbering in more farm land. At his death he owned more than two thousand acres of Wallen's Ridge and Powell's River farm lands. In 1898 Tom's father and a group of business men organized the first bank in Claiborne County, TN. His father was a charter member of the Board and served continuously for thirty-seven years until the time of his death. In 1920 his father also organized the Peoples Bank of Ewing, VA, and served as its President and Chairman of the Board until his death, January 6th, 1935. His father was also sought regularly to run for public office but he never accepted. He was active, however, in the support of candidates when he thought they would serve honestly and respectfully. Thomas Bacon Fugate was educated in the public schools of Tennessee. The school term in 1905 was three months, this supplemented by three to five months' subscription school. The buildings were logs with split benches. When he was in the fifth grade, a new frame building was constructed one-half mile closer to his home. The log building was three miles away. At the beginning of his seventh grade year, Tom was placed in a school six miles from his home where he boarded in a private home through the week, and walked home for the weekend. He attended high school at Tazewell, TN, the county seat of Claiborne County, from 1914 through 1917 when he graduated. In his junior and senior years of high school, Tom came in contact with a teacher who greatly influenced him in appreciation of the great English and American literary writers. She was Helen Elizabeth Galbreath who had been reared and educated in Knoxville, TN. She attended Knoxville schools and graduated at the University of Tennessee with a major in literature. She taught her first school at Claiborne County High School. Outside of Tom's family she was to influence him more than anyone else. Tom considers that she taught him the true worth of the great writers of prose and poetry and testified to him a love for all that is fine in the realm of literature. She achieved a close rapport with their works and was able to detail their fine points in her teaching. Her appreciation of the beauty and the intellectual depths of their writings was reflected in her life and her acts. Milton, Shakespeare, Browning, and Tennyson of the English writers; and Robert Burns, the Scottish poet, were as familiar to her as Bryant, Emerson, Longfellow, Whittier and Poe. Two years in her classes for Tom were the opportunity of a lifetime. In the fall of 1917, Tom entered the University of Tennessee. At the age of eighteen he registered in the World War I draft. In the spring of 1918 he was classified as I-A, and came home from school to await his call. The War closed in the summer of 1918. During the year he did some school work at Lincoln Memorial University. He has been a student all his life and in the early years, he ride widely. Biography and history were the two fields in which he was most interested. To widen his knowledge he began early in his life to travel, and has traveled by automobile to every state in the Union except Alaska and Hawaii. He has extended these trips to cover all the Provinces of Canada except the Northwest Territory and the Yukon. He has spent time and traveled widely in South and Central America, Europe, Asia and the South Pacific. People and places where history was and is being made are his primary intellectual interests. On June 13th, 1918, Thomas Bacon Fugate married Lillian Oretta Rowlett, daughter of Marshall N. and Cordelia Minter Rowlett, of Rose Hill, VA, the eldest of three children. Tom recalls that the date they had set for the wedding came near the end of the week. His father, on the day of the wedding, asked if he were going to be away for a few days. Tom's answer being in the affirmative, his father said, "Don't you think you should cut that small field of whet before you leave?" Knowing his father, Tom perceived this to be an order. He went to work with one man to put the binder in shape for field work and to get the teams ready to move as soon as the grain was dry. The binder was new and stiff, the grain was heavy; working with all their might they finished by noon. Tom left the driver to care for the teams and dressed, left without eating lunch, drove a Model T Ford twelve miles, picked up his bride to be, then drove eighteen miles to the home of the minister where some friends were waiting. They were married and boarded a passenger train at 4:00 p.m. for Knoxville, TN. After three days of honeymooning, he was back home on Monday morning ready for work. Our marriage was blessed with five children, three girls and two boys: Maureen Fugate Shandrick, librarian at Jonesville High School; Harry M. Fugate, business man and farmer of Ewing, VA; Katheryn Fugate Testerman, wife of G. E. Testerman, cost accountant at Union Carbide, Oak Ridge, TN; and Francis Bacon Fugate, general manager of Arabian-American Oil Company, Dhabran, Saudi Arabia. The second child, Louise Geneva, suffered an accident at the age of eleven which caused her death. We have twelve grandchildren. Tom Fugate's business life was in one part, a copy of his father's; in another part, was of his own creation. He followed in his father's footsteps in farming, lumbering and banking, but added two additional interests; community service and active participation in government at both local and national levels. In 1921 he became a partner in a mercantile business which continued twelve years. He left his home in Tennessee and moved to Virginia where he built a new home. In 1933 and 1934 he was a representative for Home Owner's Loan Corporation of the U. S. in the State of Virginia. In 1935, he became President and Chairman of the Board of the Peoples Bank of Ewing, Ewing, VA, which position he still holds. Prior, to 1935, he had been Vice- President of this bank. In 1936, he organized a farm supply business in Ewing. In 1937, he organized the Ewing Livestock Company of which he is president. Through the years, he has helped to establish other business enterprises in which he holds executive positions. Tom has owned and operated farm land since he was twenty years old. In addition to operating the farms which he has personally owned, he supervised the farm land owned by Lincoln Memorial University, consisting of over a thousand acres, for fifteen years; also, for many years he has operated and supervised other farms consisting of several thousand acres. He has administered numerous estates, some running into hundreds of thousands of dollars, served in fiduciary capacities as guardian, trustee or executor. There are many instances where he has served as a representative of families in land divisions and appraisals. Tom Fugate's entrance into governmental service was purely accidental. The Democratic Party held a nominating convention in Pennington Gap to select candidates for Lee County offices. Because he happened to be there he was nominated for State Representative. Not a word had been said to him before about the nomination. It took him about a month to decide to accept, and he was subsequently elected. His service in this office opened his eyes to the fact that dedicated public servants were sorely needed, and persuaded him to spend time and effort to achieving good government. He has often said that his service in the county government was most rewarding. Here the work is directly at the base where most human problems begin and find an end. He has also found that there are many opportunities for the public servant to do a real service for his community at this level. He can help make it possible for a tenant farmer to send his children through an elementary school and then through a four year high school; he can see that a bus is provided for school children who have no transportation; he can help build a good road into a community where there has been none before; he can assist a seedy senior citizen who has worked all his life for small wages to get a justly merited welfare check; he can get some one eligible for home care to receive nursing and medical attention and see that a retarded child gets the needed specialized assistance. At the county level members of the county government work with state and federal agencies to get other monies for use in worthwhile projects. Examples are: a water system, a sewer system, a recreational facility and a work project directed at improving the community and the county. In 1928 Tom was elected a member of the General Assembly of Virginia where he served two years, 1929- 1930. From 1929 to 1958 he served as Vice-President of Cumberland Gap National Historical Park Association for Virginia. During this period, the Association promoted and established the Cumberland Gap National Historical Park. It is interesting to note that the foresight and wisdom exemplified by this group of men in procuring and preserving the Park lands in their undamaged state has been borne out by the national concern which has recently developed over the air and water pollution which has become so distressing across this land. In 1929 he was appointed by the Governor of Virginia as a member of a Commission to study the mineral resources of Virginia. In 1936 he was appointed a member of the Lee County Board of Supervisors to fill an unexpired term of two years and in 1938 was elected for a four year term. During his term of office he was instrumental in consolidating Ewing and Rose Hill High Schools into the central high school which he personally named Thomas Walker High School. He also served on the Lee County Board of Public Welfare for ten years. In 1950, he was elected a member of the Board of Trustees of Lincoln Memorial University. He has served twenty years and was reelected for three additional years on June 6, 1970. During this period he served eight years as Vice-President of this College, eight years as Vice-President of the Board and was a member of the Executive Committee for sixteen years. In 1944, Tom was elected a delegate to the Democratic National Convention. In 1945, he was elected a member from Lee and Scott Counties to the Constitutional Convention of Virginia. Tom's interest in national politics came when John Flannagan, who had been in the Congress of the United States for ten years, asked Tom to renominate him at the Ninth District Convention. After the Convention, Congressman Flannagan further asked Tom to manage his campaign to which Tom agreed. His performance was so successful that he continued his management for four consecutive and successful campaigns. When in 1948 Congressman Flannagan decided to retire after eighteen years of service, Tom was the choice of the District Convention and was elected to his first term in Congress in November of that year. On January 3rd, 1949, he was sworn in as a member of the 81st Congress. He recalls that a former Congressman had told him it would be like matriculating at one of the great colleges of America. Tom found that Congress was more than a school. He considers his four years in Washington to be the most exciting and challenging of his life. This was a whole new experience where the viewpoint must include the National Governmental perspective as well as local Governmental needs and objectives. Tom often tells this story about his early experiences as a congressman. The President of the United States, Harry Truman, after inviting the new members of the 81st Congress to a room of the Capital one night to welcome them to Washington, said, "Boys, I knew what you think and how you feel. You are just like I was when I came here the first time as a freshman Senator. I asked myself; 'How in the hell did I get here?' After I had been here about six months, I said to myself one day, 'How in the hell did some of these other fellows get here?'" Perhaps the most outstanding contribution of Tom's service in Congress was the legislation he sponsored to streamline the operation of the Panama Canal. The United States bought the Canal Zone from France in 1903 and, at the same time, entered into a treaty with Panama. The Canal was finished and opened for transiting in 1913. Not one year since the operation began had tolls been adequate to defray costs. In 1950, the President of the United States and the Secretary of the Army wrote the Chairman of the Committee on Merchant, Marine and Fisheries to have a study made and recommend to the Congress legislation to separate the different functions into separate categories; that is, the civil and military were to be divorced from the Canal operation. From 1913 the appropriations from the Treasury had been made annually to make up deficits. Judge Otis Bland, Chairman of the Committee of the Congress, appointed a three man sub-committee of which tom was a member. One of the members of the sub-committee attended only one meeting. Later the other member withdrew. Hearings on the Canal were held in Panama and in Washington. The end result was that the civil government of the Canal Zone was required to finance their operation, less taxes, from their treasury. The Carribean Command was to look to the National Defense for their funds. The business for operating the Canal was made self- sustaining; that is, tolls were increased sufficiently to pay all costs. The year 1953 was the first year since 1913 that the income was equal to the outgo. It is interesting to note that this operation entailed something like sixty-five million dollars annually, giving one a picture of the size and importance. Tom's efforts in this area were formally reorganize by commendations from both the Secretary of the Army and the President of the United States. Because of the outstanding nature of the service to the Government in respect to the Panama Canal, Tom was sent to Mexico and Nicaragua to confer with officials of those countries about the possibility of a second Canal. The military were interested because the present Canal was not large enough to accommodate some of the large carriers in the Navy. During the last two years of his service in Congress, he served on the Banking and Currency Committee. Because of his banking experience he was appointed a member of a sub-committee to check loans made by the Export-Import Bank of the United States to the countries of Europe and Asia. While on the Committee he visited eleven countries for the purpose of business conferences with appropriate foreign officials, including President Tito of Yugoslavia. The Export-Import Bank granted credits of three and one half billion dollars in 1951. 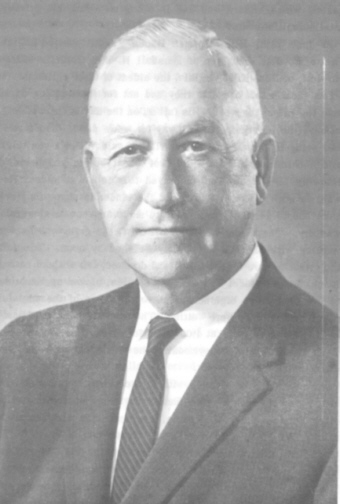 In 1950, he was elected a member of the Board of Visitors of Emory and Henry College and served for two years. In 1961, he was appointed by the Secretary of Agriculture, Orville Freeman, for eight consecutive one year terms as a member of a four man State Committee to administer the agriculture laws and regulations of the Agriculture Stabilization and Conservation Service in Virginia. The work required ten to fifteen days a month. In addition to committee work, there were numerous assignments that required him to travel throughout the United States. Tom Fugate's church affiliation is with the Presbyterian Church. Moving from a Baptist community to a Presbyterian, he joined that church in 1923. In 1925 he was elected an Elder. He has served on the Session for forty- five years. Beginning in 1922, he has taught the adult men and women's Bible Class. He continues to teach this class and enjoys it. Twice he has been a Commissioner to the General Assembly of the Southern Presbyterian Church. In 1968, he was chosen the outstanding citizen of the year in Virginia by the Order of the Fraternal Americans. This organization has named seven people to this honored position, two of which were the Honorable Harry F. Byrd, Sr. and the Honorable Colgate W. Darden, Jr. In 1969, he was elected a member of the Board of Visitors of King College for a period of three years. During the last five years Tom has been a charter member of Board of Directors of the Lee County Recreational Center which has purchased land and built facilities which for the first time provide Lee County citizens and their guests with golfing, swimming, tennis and camping. This project cost a quarter of million dollars. He has been a member of the Lee County Planning Commission since 1961. Tom holds membership in the following: Martin Station Lodge, 188 A. F. and A. M.; Royal Arch Knights Templar, Consistory, Shriners, Eastern Star Cumberland Chapter 170, Order of Fraternal Americans; he has been listed in Who's Who in America, Who's Who in the South and in American Business. He is the Chairman of the Ninth District Democratic Congressional Committee, member of the State Democratic Central Committee and the State Democratic Steering Committee. In concluding, I want to summarize my husband's philosophy of life. He sees men and women of all nations and all cultures, of all levels of the economic spectrum as God's people. Whether they live in the Valley of the Mississippi or the Valley of the Nile; whether they live high in the Andes or along the Apennines, they have all a rich history, they and their forebearers. Those struggling against the forces of nature are ever in need of spiritual food and material assistance. Whether or not they respond to friendliness and kind treatment is not the question; the primary objective is that they develop a positive attitude within the Christian concept to contribute substance to man's eternal good. He is challenged by the opportunities and responsibilities of life.